UN mandate, resource and accountability viewed as in need for improvement. Professor Sukehiro Hasegawa, President of the Global Peacebuilding Association of Japan (GPAJ) and Rd. 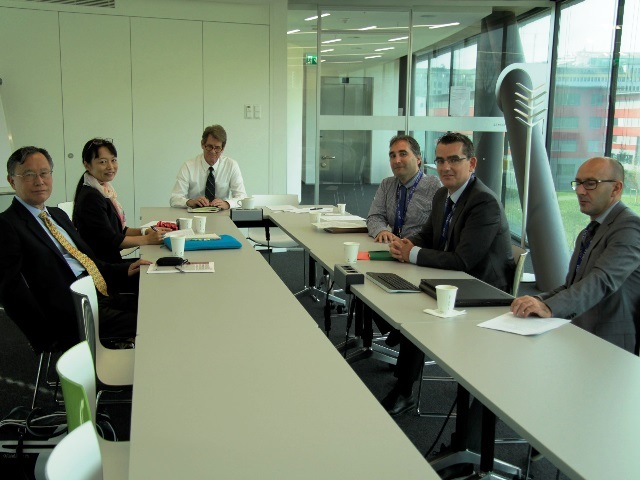 Kihara-Hunt Ai, Fellow at the University of Essex and member of GPAJ held consultation meetings with Director Ambassador Thoma Guerber of the Geneva Center for Democratic Control of Armed Forces (DCAF) in Geneva on 23 September 2016. They first held a two hour consultation meetings on UN Police reform and Japan`s policy change in its support of the UN peace operations. Dr. Mark Downes, Assistant Director DCAF and Head of the International Security Sector Advisory Team (ISSAT) of DCAF introduced the outcome of the external review of the functions, structure and capacity of the UN police division which was carried out by ISSAT and Dr. Ai Kihara-Hunt, expressed her agreement with the findings of the review and the need to empower UN Police Advisors, the UN Police Division and heads of UN Police components in order to integrate the UN police into the bigger picture of UN Peace Operations. She presented her findings that issue of individual accountability is also linked to the challenges that the UN Police faces in terms of their structure, human resource and operational model. Professor Hasegawa explained the recent developments concerning the Japanese policy towards UN peace operations including the authorization given to Japan`s self defines forces to engage in kakekomi-keigo, rush and rescue operations. 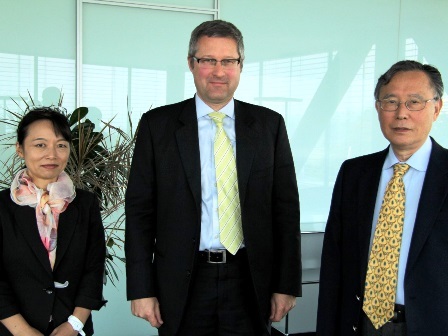 Professor Hasegawa and Dr. Kihara-Hunt Ai were guests of DCAF Director Ambassador Thoma Guerber, and also met with Japanese Ambassador Junichi Ihara of the Permanent Mission of Japan to the International Organizations in Geneva. The following is a report on the consultation meetings held by DCAF and GPAJ. Professor Sukehiro Hasegawa, President of the Global Peacebuilding Association of Japan (GPAJ) and Rd. Kihara-Hunt Ai, Fellow at the University of Essex and member of GPAJ, visited the DCAF office. From DCAF, Assistant Director of DCAF and Head of the International Security Sector Advisory Team (ISSAT) Dr. Mark Downes, ISSAT members Mr. Michael Johnson, Mr. Patrick Hagan, Mr. Pedro Rosa Menes, and Ms. Elsa Dazin attended the meeting. It served two main purposes: a) to discuss the report of external review of the UN police published in 2015, and b) to seek ways of cooperation between DCAF with Japan, taking into consideration recent trends in peacekeeping and peacebuilding in Japan. Prof. Hasegawa introduced his initiatives in relation to United Nations (UN) studies in East Asia. He chairs the Global Peacebuilding Association, which provides a forum for academics and practitioners in Japan to discuss issues related to peacebuilding. East Asian Forum on Peace Operations involves experts and academics from Japan, China, South Korea and Mongolia. It had the first expert gathering in April 2016. Academic Council on the United Nations System (ACUNS)’ East Asian branch has academics and practitioners from Japan, China and Korea. Prof. Hasegawa expressed his intent to create an impact by bringing experts in neighbouring countries together. Dr. Mark Downs explained the mode of operation of DCAF, which is consisted of member States, currently of 64 of them. They are mostly European States, but DCAF is attempting to be a more global organization, and would welcome Japan as a member. Mostly DCAF deals directly with government entities, and the model of cooperation and assistance is tailored to specific needs of the member States. Currently three geographic areas are in focus: Europe, Middle East and North Africa, and Sub Saharan Africa. International Security Sector Advisory Team (ISSAT) is a standing capacity to support international capacity, through advice, training and capacity building, knowledge services and advocacy. Last year, DCAF worked as the secretariat for the external UN Police review. The review was co-chaired by former Special Representative of the Secretary General (SRSG) Hilde F. Johnson and Ambassador Abdallah Wafy, the Permanent Representative of Niger to the UN in New York, and the team was consisted of seven experts. They had consultations at the headquarters and in the field, including through a 3-day workshop in Entebbe, Uganda, consultations with Group of Friends, 10 top Police Contributing Countries (PCCs), senior police advisors and members of Special Committee on Peace-Keeping Operations (C-34). Findings of the external review on the UN Police were presented. The UN Police are operating in changing environment, and face a number of challenges including that of struggle to secure sufficient number of appropriately trained police personnel, militarization of police, and the increased complexity of mandates that have to be delivered with the same type of police personnel. At times they must deliver tasks that they are not trained in, and as a result they deliver diverse results. The UN is left with two choices: to make fundamental changes in the supply of human resource to deliver the mandate, or to make the mandate less ambitious. Providing assistance in institution building requires different skills from those of policing or providing training. For some of those newly required skills, civilian experts would be better suited than uniformed personnel. It was generally agreed that the challenges of the UN police are of the nature that requires a significant change in the UN police’s approach. Civilian expertise may be necessary in a number of areas, for example, to address finance at the ministry level to effect changes in the host State’s police institutions. However, there is a big divide in PCCs on what capacity they are willing to send. Security Sector Reform (SSR) requires a long-term commitment with development approach, working alongside the national government. Therefore, the involvement of political figures in the host State is vital. The focus cannot just be on the effectiveness of the security sector but also on ensuring that there is system in place to utilize it. It was also agreed that the UN Police needs to be integrated into the bigger picture of UN Peace Operations, and for that, their key positions need to be made more senior. Prof. Hasegawa raised the possibility of values added in taking Eastern approach into account, where peace is considered to be akin to harmony. Above analysis was discussed in some details in the settings of Timor-Leste and South Sudan. An agreement was reached in that Sustainable Development Goal (STG) 16 (Peace, Justice and Strong Institutions) is universal, but that recognition of realism is necessary. Changes happen over a long period of time. Dr. Kihara-Hunt presented findings of her research on individual accountability of UN Police personnel. The data and analysis of UN accountability mechanism indicated that the issue of accountability is also linked to bigger challenges that the UN Police is facing: that of human resource, changing environment in which they operate, structure, transparency and institutional culture of accountability. Prof. Hasegawa presented ideas for Japan’s contribution in the area of Peace Operations. One idea is to have a UN Police academy in Japan to train national police officers in the region and certify them fit for UN Peace Operations. Japan is already spending USD 30-40 million to African institutions, and it may be better for Japan to expand what it does well and provide training for police to join the mission, rather than to defend its inaction. With the current paradigm shift in the domestic arena, Japan is sending military contingents to South Sudan. They can protect UN and Japanese personnel, but not local civilians. This may cause friction on the ground, as it is not consistent with the Protection of Civilians (POC) mandate that the UN Mission in South Sudan (UNMISS) has. It is recognized that POC mandates are so challenging that they are not always delivered on the ground anyway. However, in some situations, it may be better that the UN is not there on the ground rather than being there while failing to deliver POC mandate.